Take a close look at this planter: you won’t find an actual plant inside, but instead, you’ll see a special kind of sculpture. This was in fact an auspicious planter display that was very popular in the Qing dynasty court. 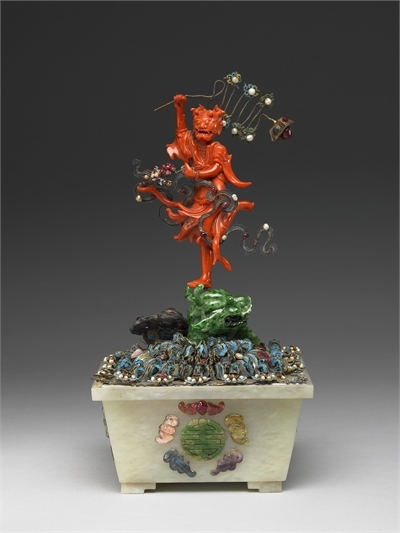 Here, the figure is the Planetary Deity Kuei-xing delicately carved from a piece of red coral and holding a representation of the Big Dipper. Legend has it that the Kuei-xing was a highly educated scholar, but his ugly appearance always prevented him from passing the civil service examinations. In a fit of anger and resentment, he threw himself into the waters but was saved by a fish dragon. Thereafter, he was transformed into the celestial head of the Big Dipper and was put in charge of determining the outcome of examinations, and career advancement. He thus became one of the commonly worshipped deities. 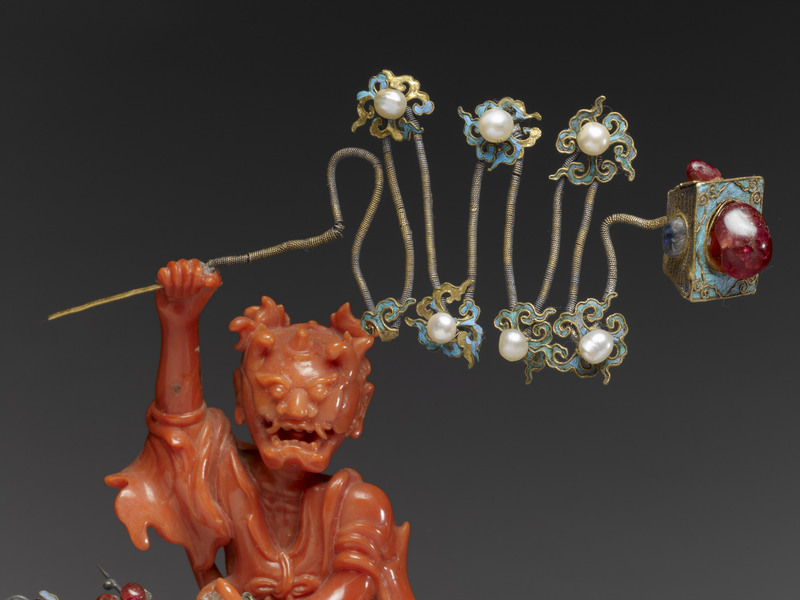 The figure seen here is completely in vermilion red, with budding horns, bushy eyebrows, protruding eyes, and fangs, for a fierce and animated look. 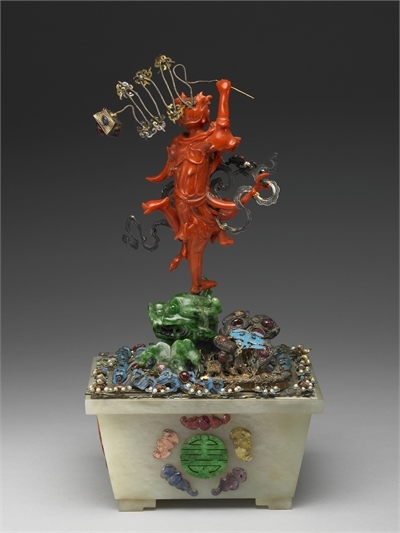 The deity is accompanied by accessories such as fluttering sashes, and holds a representation of the Big Dipper and a branch of plum blossoms. He is standing on the head of a fish dragon with a dragon’s head and fish’s body carved from green jadeite, and soaring among surging waves. The two objects held by the deity serve as symbols for coming in first place in the civil service examinations. One of his legs is also kicking back towards the main star of the Big Dipper. Known as the “dipper kick,” it is a metaphor for being the best among those on the list of successful examination candidates. The Deity Kuei-xing not only represents prospect of success in the civil service examinations but is also surrounded here by various auspicious symbols. 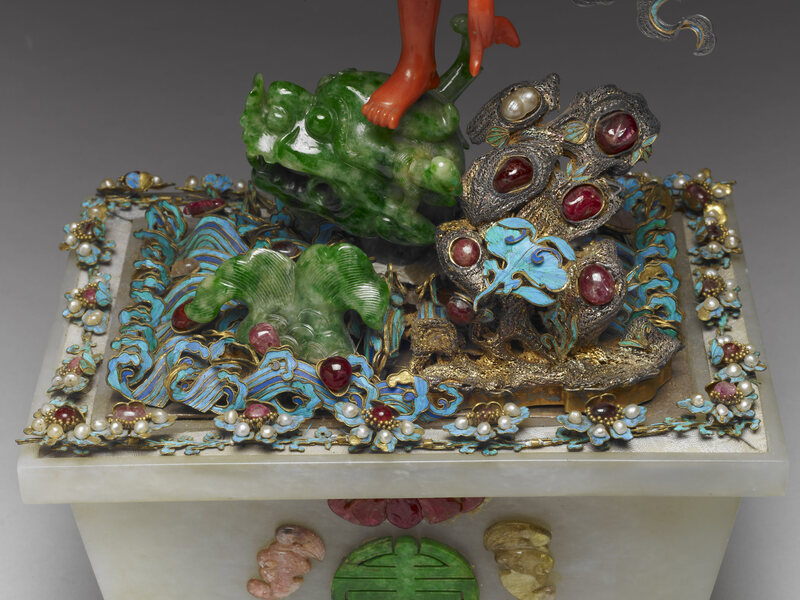 The sides of the jade planter, for example, are adorned with images of multi-colored bats surrounding a longevity character, symbolizing prosperity and long life as well as good fortune at one’s doorstep. The fungus on the garden rock in the planter is an auspicious imagery of immortality, while the branch of plum blossoms in the deity’s hand also serves as a harbinger of spring, blooming before all the others. This sculpture features lively carving and skillful inlay techniques combining gold, silver with semi-precious gems and convey auspicious connotations, all that makes this piece of display exquisitely beautiful.